It’s been ages since I’ve made a post from something that I’ve made after being inspired by Pinterest. The last time I did a food-from-Pinterest post was October 7, 2013, which happened to be the day that I found out I was pregnant with Zachary. Holy moly, time flies. Anyway, I decided to get back to that tonight. I’m not sure what inspired me, other than I just felt like a food project. 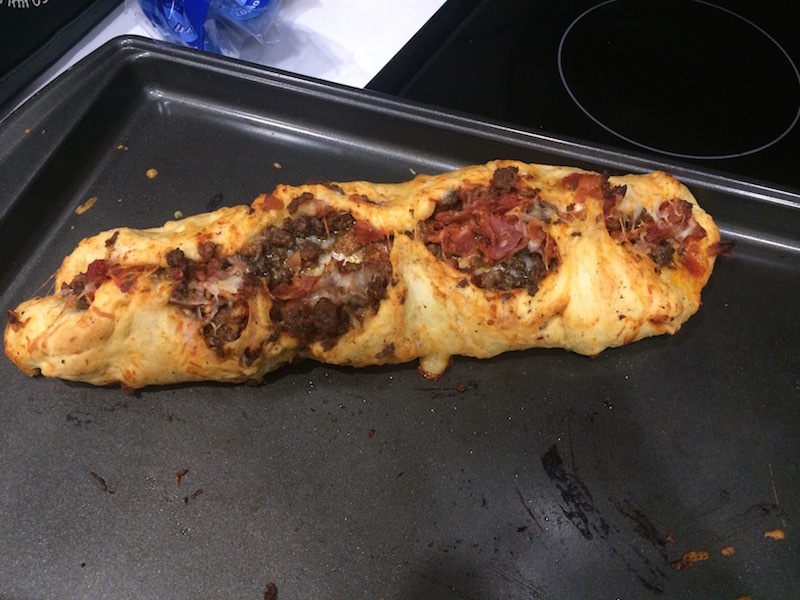 On the menu was a recipe I found for “Bacon Cheeseburger Pizza Pinwheels.” I didn’t quite understand the recipe, so I modified mine a bit and it ended up being more like stuffed bread or a really messy stromboli, lol. The presentation wasn’t as nice as I hoped it would be, but it was delicious nonetheless. I’m going to make it again soon and correct what I did wrong (which I’ll note below). 2. 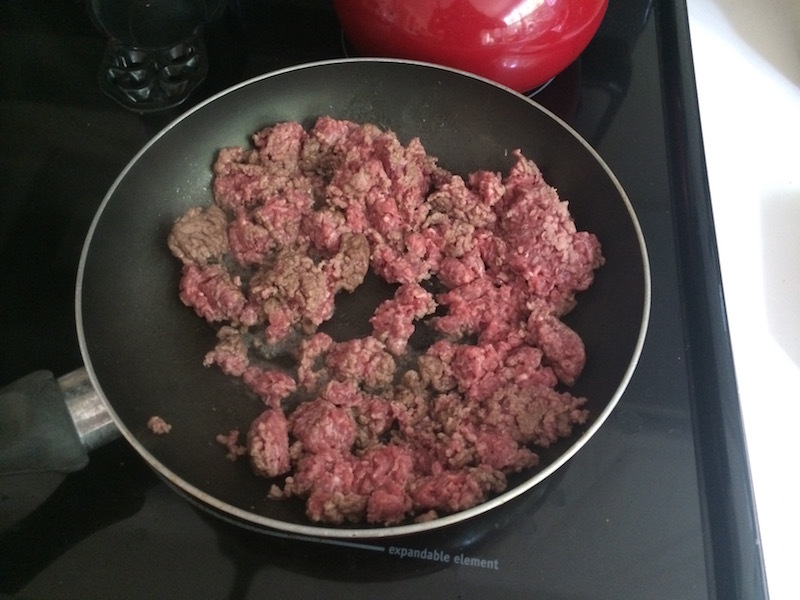 Cook and drain the ground beef. 5. Sprinkle the mozzarella and cheddar on top of the crescent rolls. 6. 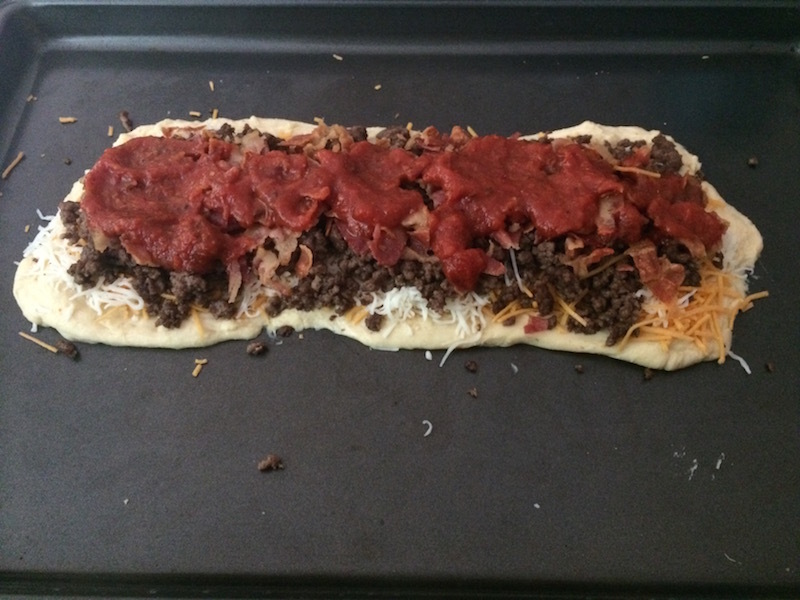 Add the ground beef and bacon on top of the cheeses. 7. 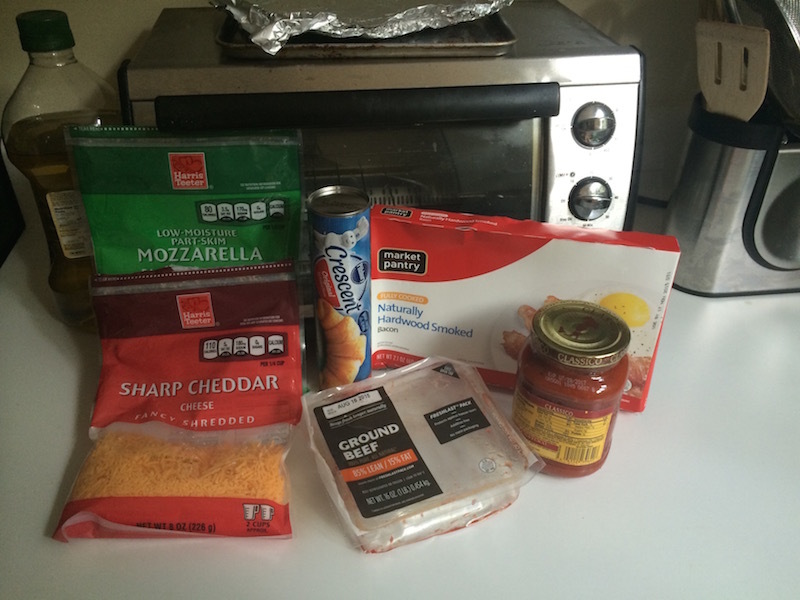 Add pizza sauce to the top. 8. 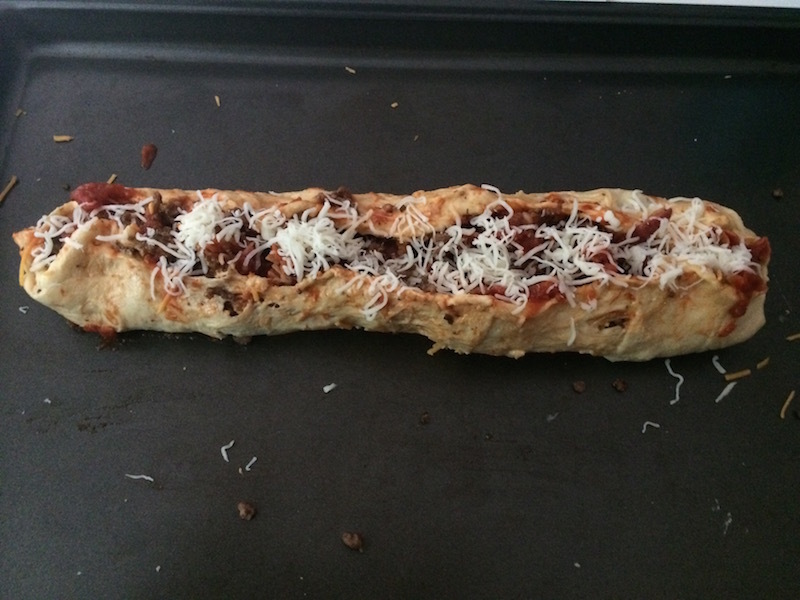 Roll up the dough so it covers everything, then add cheese and garlic powder to the top. 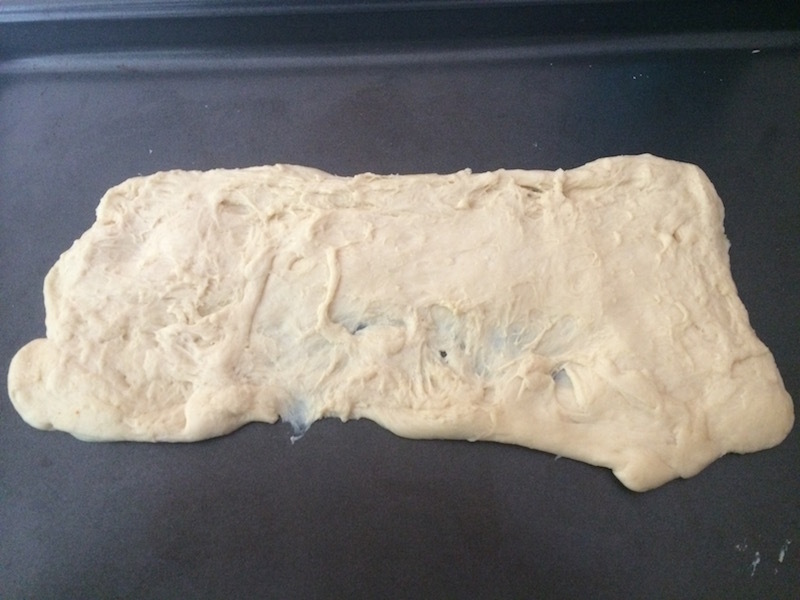 (I either didn’t stretch the dough enough because of how I took it out of the can or I put too much of the fillings in!) Option to cut it into rolls. 9. Place on a pan/baking dish and bake for 18-20 minutes or until golden brown. Like I said, the presentation wasn’t a nice as I had h0ped, mainly because I couldn’t get it to roll completely closed! However, it didn’t make a difference at all in the taste. It’s meat, bacon, and cheese. How bad could it taste?! Both Jay and I thought it was delicious and agreed I should try it again with some of the corrections. I can’t wait to try making this with other things inside! 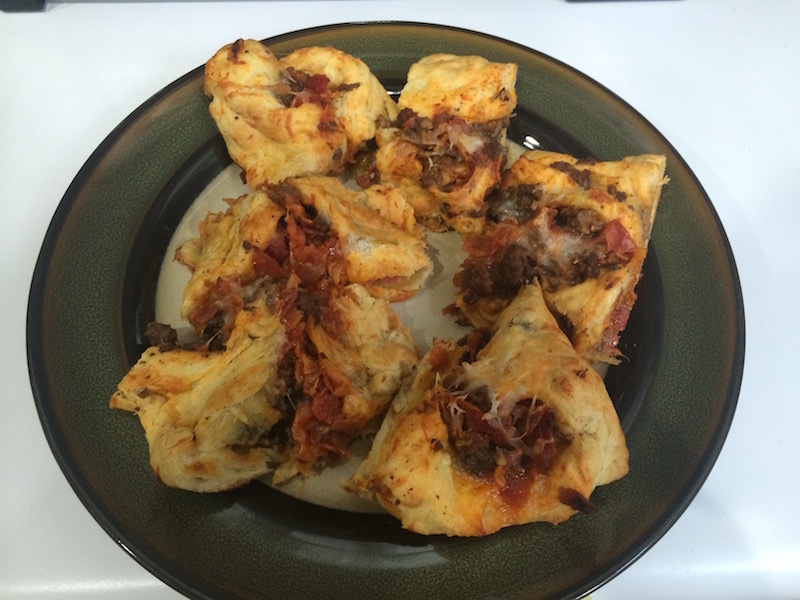 This entry was posted in Arts & Crafts, Food and tagged bacon cheeseburger pinwheels, bacon cheeseburger pizza, bacon cheeseburger stuffed bread, bacon cheeseburgers, Food, Hamburgers, Pinterest, Recipes. Bookmark the permalink.